THE SHOW MUST GO ON is a powerful, exciting behind-the-scenes documentary about the Flying Wallendas, who have been trapeze and tightrope artists for eight generations. THE SHOW MUST GO ON has incredible jeopardy and a strong moral, pro-family worldview, with strong references to Christian faith and group prayers to Jesus. 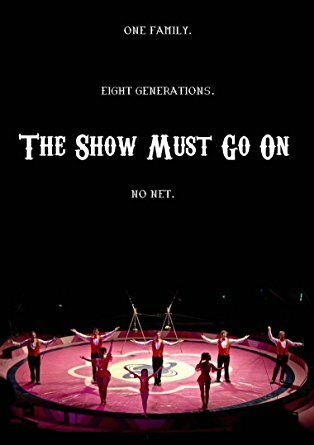 THE SHOW MUST GO ON is a powerful, exciting behind-the-scenes DVD special about the Flying Wallendas, trapeze and tightrope artists for eight generations. The documentary starts with the Wallendas praying before they go to perform their act at the circus. Tino is the present-day leader of the family. He took over from his father, Karl, after Karl fell to his death doing a dangerous tightrope stunt between hotels at the age of 73. Tino explains that the Wallenda family has been circus performers for eight generations, starting in Bohemia and then performing all over Europe before finally being brought to the United States by the Ringling Brothers and Barnum & Bailey circus. Their most dangerous high-wire act was a seven-person human pyramid. On June 30, 1962, the pyramid collapsed and two of the Wallendas were killed and one paralyzed from the neck down. Years later, Tino decides to perform the human pyramid again, but after many performances, he stopped because it was just too dangerous. Tino and the current Wallendas talk about their love of circus performing, despite the fact there’s little money in it. They also discuss their training from the time they were little children, and their concern that the world of circus performing is dying. Tino explains that the thrill of glory may last a few seconds on the high wire, but the work, the preparation, the stringing of the wire, and the moving from town to town is incredibly intense. THE SHOW MUST GO ON has incredible jeopardy because, after the initial revisiting of the tragic fall in 1962, it’s clear how dangerous these acts are. Having grown up in the entertainment industry, I find this documentary is one of the best pieces of entertainment showing the nature of the performing arts behind the scenes. The Wallendas are committed to family, and they’re committed to faith in Jesus Christ. They donate their time to perform in prisons, and they speak in churches. Their nephew is famous for walking across the Grand Canyon and Niagara Falls while praying to Jesus all the way. THE SHOW MUST GO ON is a must-see documentary. THE SHOW MUST GO ON is a powerful, exciting behind-the-scenes documentary about the Flying Wallendas, trapeze and tightrope artists for eight generations. The movie starts with the Wallendas praying before they go to perform. Tino is the present-day leader of the family. He discusses two accidents that took the life of three Wallendas, including his father. The current Wallendas talk about their love of circus performing, despite the fact there’s little money in it. They also discuss their training from the time they were little children, and their concern that the world of circus performing is dying. THE SHOW MUST GO ON has incredible jeopardy because it’s clear how dangerous these acts are. The movie is also great at giving viewers a behind-the-scenes look at the art of performing. The Wallendas are committed to family, and they’re committed to faith in Jesus Christ. They donate their time to perform in prisons, and they speak in churches. Their nephew is famous for walking across Niagara Falls while praying to Jesus all the way. THE SHOW MUST GO ON is a must-see documentary.